This past weekend I did something a little different, especially for such a sunny day. A lot of the process of learning about film photography this past couple of months has been about different process is, that it’s more impressionistic but also you can have as much control as you would with digital, it’s just different how that control is applied and the results are much more an idea of what you think they’ll be in your head than apparent right in front of you. It’s much more important I think to have a mental model of what is happening as you go along than with digital. So part of what I wanted to do was learn how to process my own film. Now once you start telling people you are shooting film many people have a fond story about when they used to do it years ago, or sending their films off or taking them to the chemists. People seem to have very vague memories now of what is involved though. As to the why I want to try it? For the same reason as learning about how beer is made I suppose? So I started looking for places to learn it, thinking they would be abundant, like the beer tours I suppose but to my surprise not many were offering workshops. I do think it’s something that may start to crop up more in future though as more people want to take control of their own photos, of the whole process and be hands on with it. 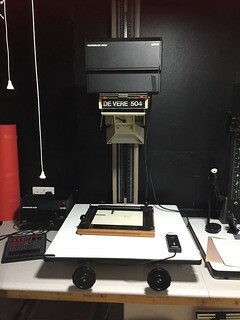 After a bit of research I found Lightbox Darkroom about 60 miles away from me in The Wirral. The course looked like exactly what I wanted to learn about. So I paid up and excitedly jumped in my car. I arrived about an hour early… I’d allowed for weekday traffic but it was a Saturday… Oh well time for a quick wander and a coffee. The course was split into two. 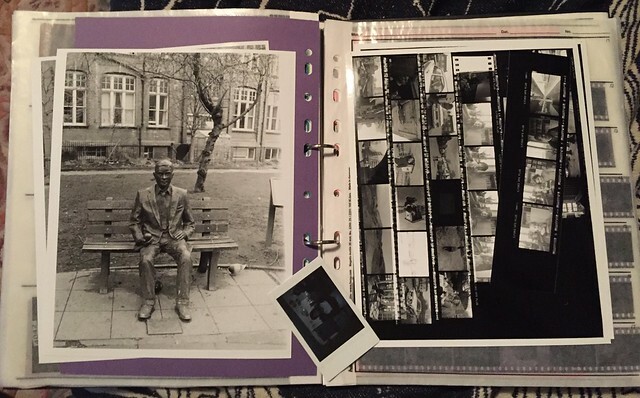 The morning for developing our film and the afternoon for printing contact sheets and a print of a selected frame. Some things surprise people about developing the film, what you can do in the light and dark for example. 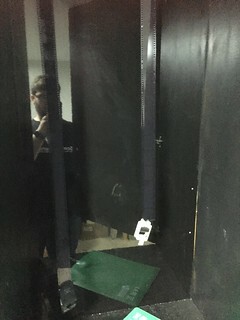 We practiced with some spare film how to get it onto a reel which when you do it for real you do in a lightproof bag. It’s a little like tying your shoelaces in the dark, against the clock (if the bag heats up too much the film can start to get a bit “sticky”). 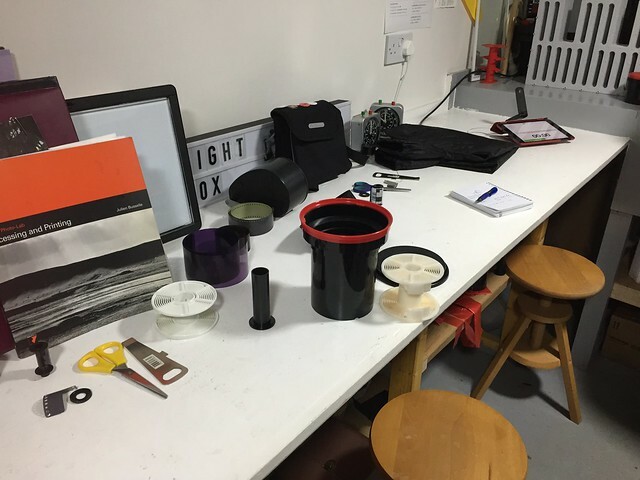 I’d brought along 35mm and 120 format, I started with the 35mm which I found pretty easy to get onto the reel and into the tank but later I had much more trouble with the 120. We went quickly through the chemicals needed and plugged in the details into a very slick Massive Dev Chart app which handles the timing for you. So, there’s three main chemicals, we went over quantities and which ones can be resued. Developer (I used MICROPHEN), Stop (ILFOSTOP) and Fixer (RAPID FIXER) and then open the tank and it goes into the sink with a running tap over it. After this a little bit of wetting agent (Fotonal Wetting Agent) and hang up the film to dry. The app is good at telling you when to agitate the tank, but you need to watch out for modifying the times according to the temperature of the chemicals. I think this part mostly likely is what I’ll start with doing at home. 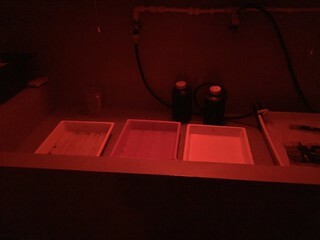 A complete darkroom set up is not necessary apart from access to water really. He had a nice cupboard set up for drying which looked quite handy for impatient people like me! The other guy on the course and I then went for lunch, it’d been about 3 hours up to this point (which had flown by!). It was a short walk to the beach so we sat and ate their discussing our respective photographic journeys. For the afternoon session we started off with cutting up our negatives into strips and then making a contact sheet for them. Quite satisfying really to get an image out so quickly. 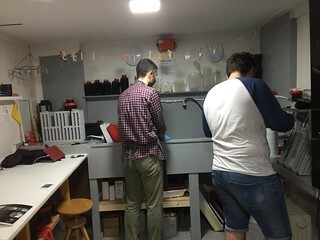 From that we learn to process of using the enlarger controls and developing the paper. 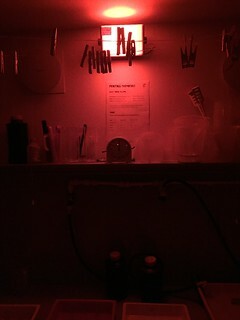 This is where actual darkness (albeit with a safe light) is required! From there we chose a shot we wanted to get a print of and went through experimenting with the exposure and contrast, using test strips to gauge the result we wanted and dodging and burning. It was very easy to see how you can get very engrossed in this part and lose many hours! Overall I had a fantastic day and would recommend Martin to anyone who is interested in learning this kind of thing. He was a great teacher and had lots of experience, being a graphic designer by trade.